German Shepherds are big dogs with big energy levels. They are lovable and wonderful pets to own but it does take some practice to learn how to effectively handle their high energy levels. In this article, we’ll look at the issue in more detail, talk about strategies for managing your German Shepherd’s energy levels and then finally do a few reviews on the toys we most recommend for helping to manage a German Shepherd’s super high energy levels. **Below, you'll find our more detailed reviews, but you can also click above to read customer reviews on Amazon. All dogs are usually pretty energetic but the bigger they are, the more power they have and a German Shepherd with pent up energy will start to get destructive. Imagine feeling ready to run a marathon but being forced to sit behind your office desk all day. You’ll get antsy and frustrated pretty quickly. German Shepherds are no different. They need a LOT of exercise and play time to help release that energy in safe, beneficial ways instead of by crashing through all your precious valuables and chewing up your favorite shoes. More importantly, a German Shepherd with too much pent up energy might turn on himself and start chewing up his feet and tail which can become a serious problem. So it’s important to make sure you give your pooch plenty of opportunities to exercise and release that energy. Go for jogs: This is great for your own health as well so you should definitely consider it. Wake up a little earlier in the morning and go for a morning jog with your pooch. They will absolutely love it and it will keep you motivated to stick to an exercise program yourself! Go for lots and lots of walks: whether you choose to add a jogging routine or not, you will also want to include plenty of walking time. Take them out as often as you can. Consider picking them up on your lunch break to go spend time in the park. Play time: your pup will need lots and lots of play time playing fetch, tug o’ war, chase, or anything else that gets them using up energy. Don’t neglect this. Big yard: a nice big yard with plenty of room to run around in is very beneficial for a German Shepherd so that even while you’re away, they can still run around and use up energy. Toys: good, quality toys that they can chew on as aggressively as they like is a great way to direct their energy away from chewing on their own tail. See below for some suggestions on which toys to buy. 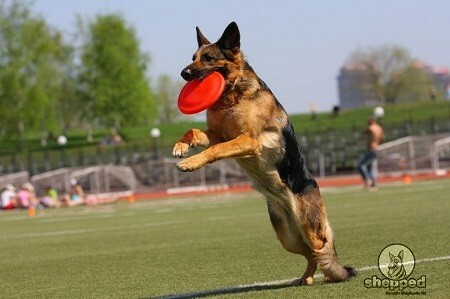 Sports: take your dog out to a park when you can for a round of Frisbee and other dog friendly sports. Other dogs: dog parks and friends with dogs will be a life saver when you are simply too exhausted. Other dogs will have energy levels and stamina rivaling their own so they don’t have to stop when a human gets tired out. Plus, it’s a great chance to meet new people or spend some time catching up with your friends. The benefit to having such a high energy dog is that it motivates you to get on your feet and be more active as well. Both of you will benefit from getting plenty of exercise and play time! When shopping for toys to satisfy your German Shepherd’s needs, the most important things to look for will be durability and quality. Cheaper toys may have an attractive price but your pooch is going to destroy them in no time. You need to invest in quality if you want something that will actually last. So with that in mind, here are our top 4 picks for toys to contain a German Shepherd’s energy. They are chosen precisely for their quality and durability. These odd looking toys are super durable and fun. They are made of durable rubber. It’s weird shape causes it to bounce in unpredictable ways which makes it that much more exciting to play with. More importantly, you can stuff treats inside which guarantee your dog will chew with determination to get the treats out so they will not be sparing with their energy. This also helps with separation anxiety. You can fill it up with treats just before you leave and your dog will spend a good 20 minutes working on getting those treats. It’s this first 20 minutes when a dog’s anxiety is usually at its peak so that’s the essential time to keep them happily working on getting treats so they learn to enjoy their alone time. We recommend getting the larger sizes for your German Shepherd. And make sure you don’t fall into the habit of giving out too many treats. Treats should stay treats so allow your pet to play with it even when it’s empty, too. Overall, it’s an awesome deal. It’s a low price, a durable high quality product and it is super fun. This is highly recommended. 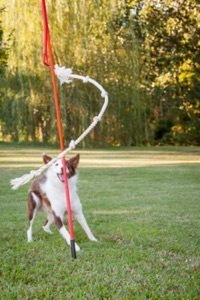 The knotted rope that every dog loves now comes attached to a pole that can be placed outdoors in your yard. That way, your German Shepherd can tire themselves out playing tug o’ war on their own—saving you from sore arm muscles! It’s perfect for keeping them entertained while you’re away. It also helps compensate for smaller yard space. They may not be able to run around as much but they can use up their energy on this toy. That doesn’t mean skimp on the walks. 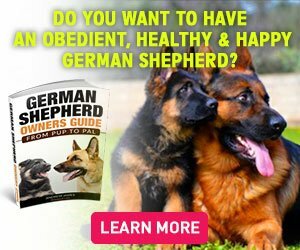 It just means you have one extra means of helping manage your German Shepherd’s energy levels. The rope is 55 inches long and designed to be durable enough for dogs that are 60 pounds or more. There’s also a small dog version in case you have a smaller pup running around, too. Our only worry here is that you might fall out of the habit of playing with your dog. While this is a great toy, it shouldn’t be a complete substitute for quality play time with you because playing with you or other dogs helps them not only expend energy but also socialize and develop stronger bonds. So as long as you make sure you are still spending plenty of quality time with your pooch, this is a great toy to help handle some of the workload. The knotted rope is a dog toy classic. Energetic dogs love it because they can chew and chew to their heart’s content without hurting their teeth since the rope is soft but durable. It’s also perfect for playing tug o’ war! This particular rope is 36 inches and has 5 thick knots spaced out across it. It’s 100% cotton so it’s gentle on teeth but tough enough to withstand an aggressive chewer like your German Shepherd. It can also help clean teeth! There’s really not much to complain about this toy. You may want to avoid letting any small children playing tug o’ war with your dog using this since the dog will be much stronger and might accidentally knock the child over. Aside from that caution, this is an excellent purchase that will last you a long time and keep your dog happy. These tennis balls designed for dogs come in a pack of two. It is made of rubber and soft tennis ball fabric both of which are very durable and ready to withstand the rough treatment they will undergo by your German Shepherd. 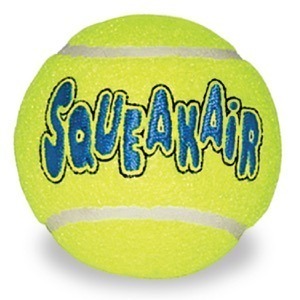 Plus, it’s very bouncy and light which makes it the perfect ball for playing fetch. The manufacturers recommend not leaving it in water for extended periods of time so it’s not ideal as a pool toy. And another point worth mentioning is that the squeak sound can become a little annoying after a while for some people. But aside from these minor issues, we love this toy for its durability and its fun design. Your dog will enjoy playing fetch with it or just sitting down to chew on it. The two keys to managing your dog’s energy levels are toys and lots and lots of exercise. Toys give them something to focus on and exercise helps them use up that energy so that they can relax later.